James' Jetsam - Your Cruise Expert: Who are Voyages of Discovery? Who are Voyages of Discovery? I was quoting a cruise for a client the other day; they'd seen a cruise advertised on our website, (www.cruise.co.uk), and whilst they loved the itinerary they'd never heard of the company, Voyages of Discovery. I think, for the right kind of person, V.O.D, (Voyages of Discovery), are an amazing cruise line but because of their small size I wasn't surprised my passenger had never heard of them. After explaining a bit about them my passenger got very excited about the cruise and ended up booking it but it occurred to me that a lot of my readers might also have never heard of them so I decided to put together a little guide of who they are and what they're about for you all. The first thing you need to know about V.O.D is that they're a small company. Both in terms of the company itself and their fleet. Currently they only have on ship, the MV Discovery, however they will be introducing a new ship, the MV Voyager, at the end of this year. More on their second ship in a bit though. Their small size actually works in their favour as when your onboard you really get that 'small ship feel' to your cruise. Playing devils advocate the MV Discovery, for some people, can feel too small and can be seen as older and more basic than a lot of the more modern cruise ships. But this again can play into V.O.Ds strengths. The point of a V.O.D cruise isn't the cruise ship at all. It's the ports of call and the experts onboard. 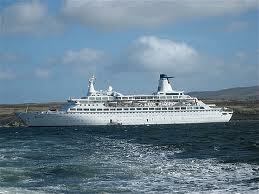 Because of the Discoverys small size it really can get into the smaller ports that other cruise ships can't. A lot of small ship cruise lines claim this but V.O.D, more than any other cruise line, really deliver on the claim. The other big selling point about them, in my opinion, is their expert lecturers, which you'll find on all their cruises. These really come into two categories. You'll have lectures onboard which can cover a whole range of eclectic topics from the Crimean war, delivered by a retired history professor to the current political state of the Middle East given by ex-diplomats. V.O.D really go all out to get great lectures onboard. The second category would be their port experts. These people will conduct a port talk the night before you dock and will give you a a complete history of the port as well as some really out of the way, interesting places to visit that you wouldn't get to hear about otherwise. Hopefully you're getting the impression that V.O.D is quite an intellectual cruise with a heavy emphasis on the places you'll be visiting and if that sounds great to you then V.O.D may just be the cruise line for you. Should I book an inside cabin? I'm going on the NCL Epic!